Still image from CCTV footage. Police are on the hunt for vandals who went on a rampage at two of the ACT’s elite private schools early on Monday morning (9 July). 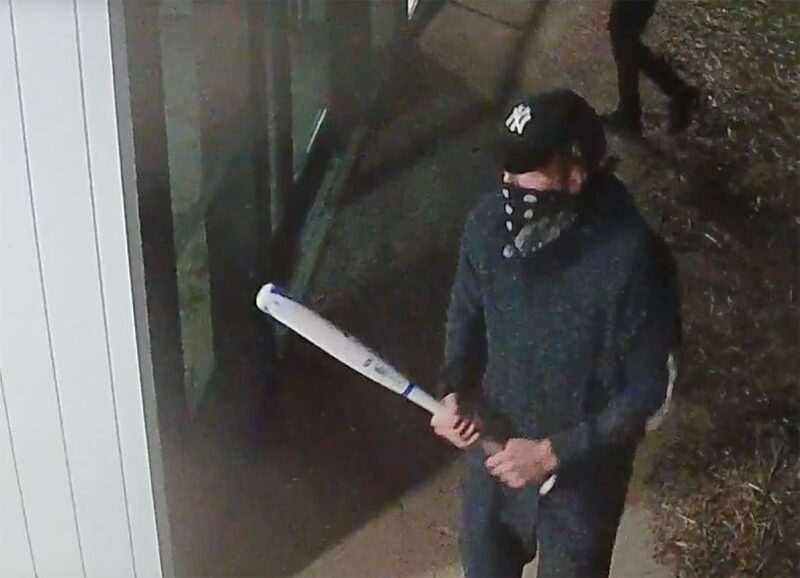 ACT Policing has released CCTV footage of masked and hooded offenders armed with baseball bats who smashed more than 100 windows at Canberra Grammar School in Red Hill and the nearby Canberra Girls Grammar School in Deakin, as well as attacking the Girls Grammar Rowing Centre in Yarralumla. Police said the attacks occurred between 1:00 am and 2:00 am, causing extensive damage, with the windows of school buses at both campuses also broken. The CCTV footage captures the attack on the Rowing Centre. One offender was wearing black Adidas branded tracksuit pants, a black, long-sleeved Nike SB top, and had his face covered by a dark piece of cloth with a lighter pattern. He was wearing a black New York Yankees baseball cap and black Nike shoes. The second offender was wearing a long-sleeved black top, black tracksuit pants, black shoes, and had his head covered by a lighter-coloured length of material as a makeshift hood. A Canberra Grammar spokesperson said 110 windows were broken and all had now been repaired. Girls Grammar declined to comment. School holiday programs were not disrupted at both schools. Police would also like to speak with the driver of a vehicle that drove past the Rowing Centre while the incident was taking place. The driver is not believed to be involved in this incident, but they may have seen it, or have other information that could help police. The vehicle, which is also pictured in the CCTV footage, appears to be a blue sports car, possibly a convertible MG.
Police urge anyone with information that could assist in this investigation to contact Crime Stoppers on 1800 333 000 or report via the Crime Stoppers ACT website. That’s terrible - what do they have against the place! If they get caught they should be desexed! Bet he moonlights for Antifa at the weekend! Lock them up and throw away the key! Hopefully the police will catch them - senseless vandals! Well at least you know for certain that this time they actually used all that private school money to benefit the schools not the "churches"
What has that got to do with it??? Someone must know this guy, he's clearly not a kid either. Andrea Kerr seems like it’s targeted to two schools so maybe a disgruntled party in a family law matter. The school fees are expensive! You should have to register your details to a national database when you buy adidas clothing. There is a certain subset of society that is encouraged to believe that their failure to become a rock star / tech billionaire is due to the existence of ‘posh’ schools. I expect these two angry morons are in that category. Maybe someone that hates that expensive private schools like this exist? I'm guessing the police will check out the radical groups to see if anyone is bragging?